Track connections between hurricanes, wildfires, climate change and other risks, urge Amir AghaKouchak and colleagues. Amir AghaKouchak is associate professor of civil and environmental engineering at the University of California, Irvine, California, USA. Laurie S. Huning is a postdoctoral scholar at the University of California, Irvine, California, USA. Felicia Chiang is a PhD student at the University of California, Irvine, California, USA. Mojtaba Sadegh is assistant professor in civil engineering at Boise State University, Boise, Idaho, USA. Farshid Vahedifard is associate professor of civil and environmental engineering at Mississippi State University, Mississippi, USA. Omid Mazdiyasni is a postdoctoral scholar at the University of California, Irvine, California, USA. Hamed Moftakhari is assistant professor of civil, construction and environmental engineering at the University of Alabama, Tuscaloosa, Alabama, USA. Iman Mallakpour is a postdoctoral scholar at the University of California, Irvine, California, USA. This has been an exceptional year so far for natural disasters. Typhoons in Asia and Hurricane Florence hitting the US east coast have caused extensive damage, flooding and mudslides. In the past two months, Scandinavia, Spain and Portugal, the United Kingdom, North America and South Africa experienced fierce forest blazes. Just outside Athens in July, one of the deadliest conflagrations in recorded history raged through coastal towns, killing 99 people. In the same month in Mendocino, California, an area larger than Los Angeles was scorched — more than 1,800 square kilometres — killing a firefighter and destroying almost 300 homes. Sweden suffered more than 50 wildfires, some even within the Arctic Circle. The unprecedented severity of many of these fires might be a sign of global warming, with worse to come. But it also highlights how extreme events are connected. 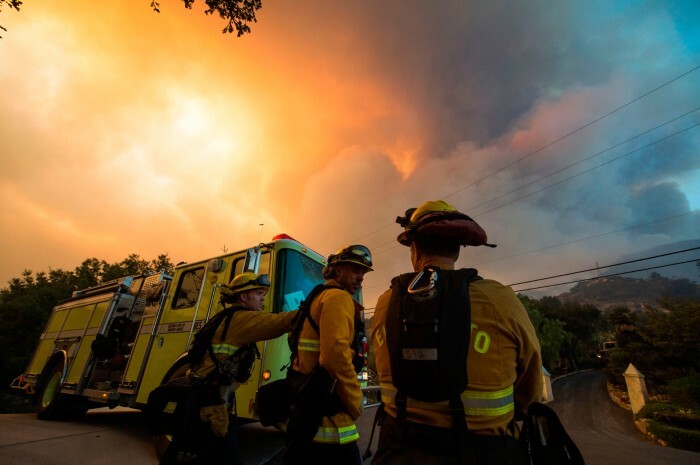 Many of the fires followed long periods of drought and record temperatures. Their occurrence also loads the dice for devastating future hazards. Charred landscapes are more vulnerable to flooding and landslides. In January, a mudslide killed 21 people and injured more than 160 near Montecito, California. The month before, a wildfire had destroyed vegetation and destabilized the soil on the town’s steep slopes. When a storm brought heavy rains, a 5-metre-high wave of mud, boulders and branches, travelling at 30 kilometres per hour, swept into people’s homes. Chains of adverse events such as these, cascading like toppling dominoes, will become more common as the world warms. Yet the scales of the cascading risks are still unknown. Risk analysts estimate the likelihood of single events, predicting rising frequencies of droughts, hurricanes and so on. They do not consider the web of connections between them. For example, sea-level rise will enhance coastal erosion and expose communities, infrastructure and ecosystems to damage from storms and surges. Risk assessments should be expanded to consider cascading hazards. Otherwise, we cannot plan for the scale and nature of upcoming disasters. Researchers must find answers to these questions: how will climate change alter the risk of disastrous domino effects? What are the implications for the built environment? And what mitigation and adaptation measures are needed to cope with more severe interlinked disasters? Here we outline how such a risk framework should be developed. The first step is for researchers and risk managers to recognize that climate change impacts do not occur in isolation, but are strongly coupled. For instance, droughts and heatwaves often occur together. Droughts lead to dry soils, which prevent solar energy from being released as evaporation, causing surface warming1. Across the United States, week-long heatwaves that coincide with periods of drought now occur twice as often as they did in the 1960s and 1970s2. Dry and warm conditions increase the risk of wildfires, which damage the soil and set the stage for later landslides and flooding. Snow and ice melt earlier, altering the timing of run-off. This has extended the fire season by 20% around the globe since the 1980s3,4. With less snow and ice in the Northern Hemisphere, the cooling effect provided by the reflection of sunlight from Earth’s surface dropped by 10–20% between 1979 and 2008 (relative to its mean value during this period)5. 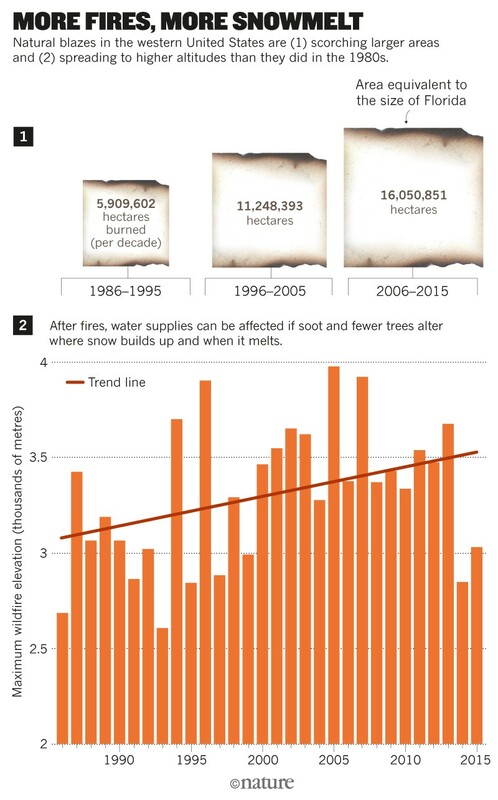 And these links now spread further: wildfires are occurring at ever-higher elevations and latitudes (see ‘More fires, more snowmelt’), where they remove the forest canopy and alter where and how snow accumulates. Soot deposited on the snow absorbs heat and speeds up melting. Likewise, dust released during droughts hastens melting, as has happened in the Upper Colorado River Basin6. Dust transported from arid regions of Africa influences the snow caps of Europe, North America and Asia. Communities are part of these cycles. For example, 60% of southern California’s water comes from melt water from the Sierra Nevada mountains7. California’s multibillion-dollar agricultural industry also depends on this source. Changing patterns of temperature, snow, wildfires and floods are challenging the state’s ageing network of dams, levees and reservoirs. These need to be able to hold more water earlier in the season, as well as prevent floods and debris flows. Minor events that would not normally cause concern can have profound impacts: unexpected bursts of melt water might trigger debris flows over burned land, for instance. Regions in the Andes, Himalayas, Alps and Rockies face similar challenges. The rapidly changing nature of hazards in a warming world will be unfamiliar to local communities. In Zimbabwe, for example, indigenous peoples are less able to draw on weather patterns, flora and fauna to predict when floods might come and force them to relocate. Meanwhile, rapid population growth and urbanization exacerbates climate shifts. For example, houses built on steep slopes might become more susceptible to landslides. Climate researchers have begun to assess some coupled risks, such as from droughts and heatwaves1,2. And efforts to minimize human and financial losses from disasters have become more cross-disciplinary and coordinated. The 2015 United Nations Sendai Framework for Disaster Risk Reduction is supporting studies of risk, exposure and vulnerability to improve resilience and emergency responses to a range of disasters, from floods to earthquakes. And the European Union’s Seventh Framework Programme (FP7) is improving knowledge, forecasting and decision tools for disaster prevention and intervention. But these programmes have yet to weave the whole tapestry of hazards together. They typically address one-off major disasters instead of connected chains of smaller events, with a focus on responding to crises rather than preventing them or boosting resilience. Some obvious links can be studied, such as the rapid sequence of events that followed the 2011 Tohoku earthquake, which triggered a tsunami that caused the meltdown of the Fukushima Daiichi nuclear reactor in Japan. But longer-term impacts of the tsunami on the region’s hydrology or coasts have not been explored. In addition, most countries adopt their own approaches for dealing with hazards. A universal framework for addressing cascading disasters is missing from current practices. Many research gaps remain to be filled. Physical cascading mechanisms, such as the impacts of wildfire soot on snowpacks or ocean waves on coastal landslides, and their feedbacks, are poorly understood. Assuming events are independent also gives a false sense of how often these events should be expected to occur, which, in turn, affects disaster preparedness. Theoretical risk models need to be able to handle multidimensional and interdependent hazards. For example, coastal erosion might be affected by global sea-level rise, earthquake-driven tsunamis, storms and infrastructure such as barriers and protections. The state of the coasts, in turn, dictates communities’ exposure. Historical records might not hold all the answers. It is also hard to disentangle causes and effects in complex networks, especially in managed systems. Quantifying how an initial event increases or reduces risks from succeeding events, and predicting their timing, is difficult8. A levee failure, for example, can have many causes over an extended period, including weakening during drought, extreme rainfall, poor design and inadequate maintenance. Data are sparse, especially from remote regions such as rugged mountains. Agencies and countries do not always share data. Different disciplines and regions use different definitions. Key observations are missing. For example, the extent of a wildfire and its immediate impacts (deaths, lost houses) are recorded, but damage to soil structure is not commonly noted. On-the-ground corroboration of satellite data is rare. Many countries restrict the use of their environmental and climate data. Long-term data sets are hard to find, especially in the Middle East, Africa, South America and southeast Asia. Disasters triggered by moderate conditions often go unrecorded. And access to computer facilities and training for processing data is inadequate in many developing countries. There is no standard protocol for collecting environmental, climate and disaster-impact data. 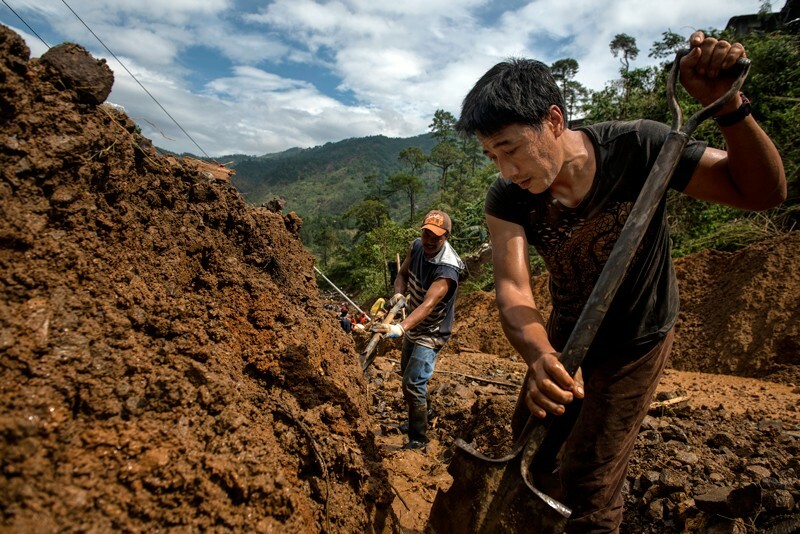 Countries have their own ways of tracking monetary impacts, loss of life and livelihoods. Researchers use different methods for describing droughts, storms, heatwaves and wildfires. For example, a meteorologist might define droughts on the basis of a deficit in precipitation, whereas a hydrologist might describe them on the basis of a change in river run-off. A global system needs to be developed to assess cascading hazards. Researchers should go beyond calculating the statistics of extreme droughts, floods and wildfires in isolation and delve into their interactions with natural and built environments. International organizations such as the World Climate Research Programme and World Meteorological Organization should take the lead in coordinating research. And intergovernmental agencies, including the European Commission, the US Federal Emergency Management Agency and the United Nations Office for Disaster Risk Reduction, as well as other hazard-focused organizations, should develop a global hazard early-warning system. Regulations and educational materials should also be developed to help engineers, decision-makers and the public to minimize their exposure to compound risks and cascading disasters. The range of data collected for hazard analysis needs to be expanded, in space and on the ground. Observations should be consistent around the globe and shared openly. We advocate for real-time monitoring, to capture extreme and moderate events as they occur, rather than retrospectively. Such a monitoring network could piggyback on other global environmental tracking efforts, such as the Global Earth Observation System of Systems, the Global Earthquake Model project and NASA’s Data Portal. Socio-economic information also needs to be collected about people, livestock, buildings and infrastructure that are at risk. Data protocols need to be broadened and standardized. And agencies need ways to evaluate progress. They can build on previous efforts to develop metrics for individual events. For example, at a meeting in Nebraska in 2009, the United Nations Convention to Combat Desertification, the US Department of Agriculture, the US National Oceanic and Atmospheric Administration and the US National Drought Mitigation Center convened experts from more than 20 nations to agree on a global set of indices for measuring and forecasting drought — the Lincoln Declaration on Drought Indices. Engineers, planners and decision-makers need to identify vulnerable infrastructure and ecosystems for monitoring. Local and national governmental agencies and researchers should improve regulations, emergency management, and building codes. After the fires in Greece this year, citizens argued that unregulated construction in woodlands and the absence of an official evacuation plan contributed to the high death toll. Community outreach and public education are crucial to raise awareness of the potential risks of cascading hazards, and to save lives and livelihoods as climate impacts mount. Chiang, F., Mazdiyasni, O. & AghaKouchak, A. Sci. Adv. 4, eaat2380 (2018). Mazdiyasni, O. & AghaKouchak, A. Proc. Natl Acad. Sci. USA 112, 11484–11489 (2015). Jolly, W. M. et al. Nature Commun. 6, 7537 (2015). Westerling, A. L., Hidalgo, H. G., Cayan, D. R. & Swetnam, T. W. Science 313, 940–943 (2006). Flanner, M. G., Shell, K. M., Barlage, M., Perovich, D. K. & Tschudi, M. A. Nature Geosci. 4, 151–155 (2011). Painter, T. H., Skiles, S. M., Deems, J. S., Brandt, W. T. & Dozier, J. Geophys. Res. Lett. 45, 797–808 (2017). Waliser, D. et al. Clim. Change 109 (Suppl. 1), 95–117 (2011). Pescaroli, G. & Alexander, D. Natural Hazards 82, 175–192 (2016).